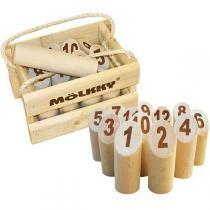 Mölkky is one of the most popular outdoor game in Nordic countries! Mölkky is a modern version of a traditional Finnish game (the "Kyykkä") from the region of Karelia in southeastern Finland. The first player to knock down 50 points worth of pins with a Mölkky skittle wins! Today Mölkky is increasingly represented in schools: thanks to this game, children can playfully learn arithmetic bases (addition, subtraction...) and develop strategy skills.